There are many things that we take for granted. Unless we are faced with an unpredictable event, we almost never have to worry about food or water not being available, even if at that time it isn’t quite affordable. What Ayo: A Rain Tale touches on is the necessity of water, the one thing that we can buy bottled at the store and leave running in out sinks. Our young protagonist, Ayo, sets out to find water for her family. Sadly, the treacherous trail to water is more dangerous than it first seemed. Though, with encouragement from her family, Ayo can certainly do it. 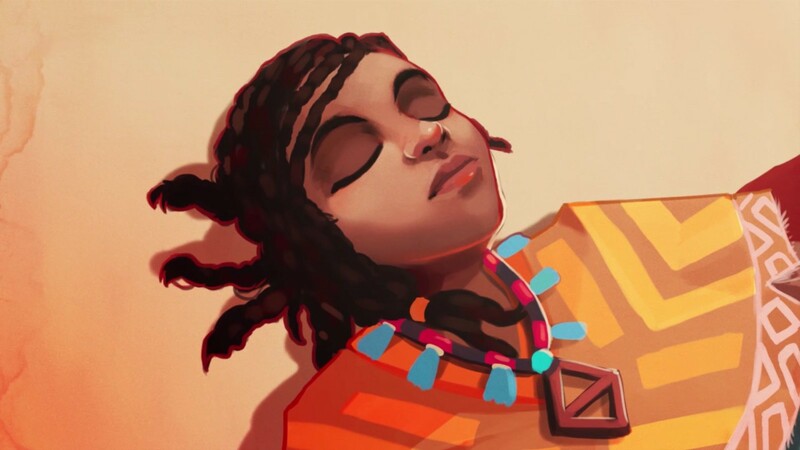 With only her clothes, a water container on her back, her wits, and the help of a few spirits along the way, Ayo sets out to find that water. Throughout your journey, you will face many dangers; from thorns along the path to wolves which only manifest based on what color is activated in the level. There are two traditional bosses that you have to face before you can get to that water. Luckily, there are two spirit twins on your side that will periodically grant you powers, such as the strength of a boar. The rest is mostly just platforming, which is sadly your enemy as well. 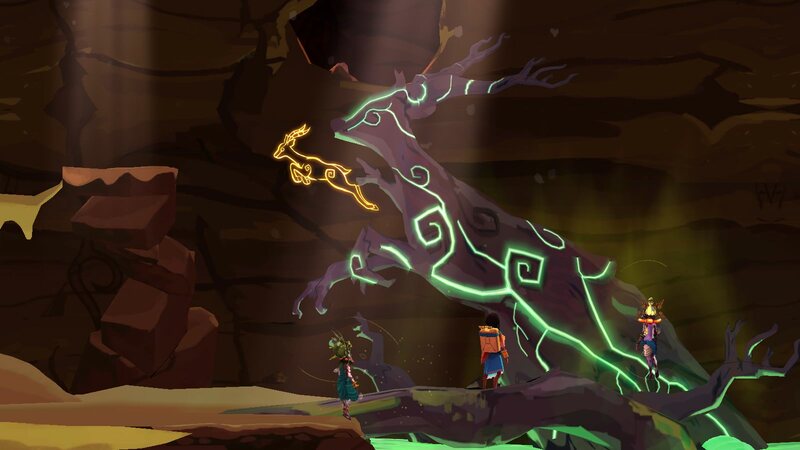 With platforming being the main aspect of the game, it is simply not as good as it should be. If the game is meant to be difficult, it is best to make the mistakes the player’s fault rather than the game’s. 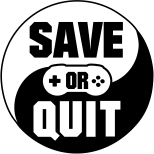 Such as with rogue-lites, you can’t cause death in a game like, for example, The Binding of Isaac because of an undodgeable attack. Rather you should die because you didn’t dodge an attack fast enough or an item you picked up is working against you. 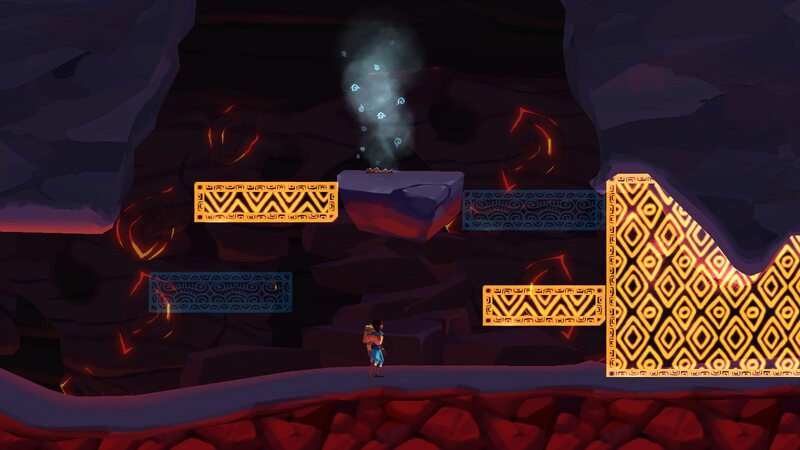 While the platforming in A Rain Tale is not difficult, you will constantly be faced with Ayo having to grab onto ledges to pull herself up. There will be times where you know you can make a jump but Ayo decides to not grab onto the platform or Ayo can grab onto a platform that looks like she probably shouldn’t be able to. Either that or a jump looks possible but is actually not. Perhaps some adjustments with the distances could’ve made it more believable throughout and to make sure Ayo can consistently grab onto ledges. There are some puzzle aspects, mainly having to do with platforms, that Ayo will only be able to stand on depending on the color activated. It’s not too difficult, with limited complicated moves, such as having to switch colors midair, but it is easy with practice. Yet the accuity of the controls and movement hinder even simple jumps. Another aspect that can be improved on is zooming in and out. Based on how big or tight a space is, the camera might pan in really close and then pan out once you get to a more open area. There are some areas where this is no problem, however, there are areas will cause the camera to be constantly changing the zoom factor, making you wait a while before you can see what you are supposed to jump on next. This ultimately becomes annoying since it could have easily kept the same camera angle to avoid this. It also causes some inconsistencies with deaths. If you fall down a certain height without the ground being viewable you will die, but at the same time if you see the ground, you will live. It is even more annoying when you know the ground is there but you die where you shouldn’t. I would be lying if I didn’t say that I quit the game for a while. 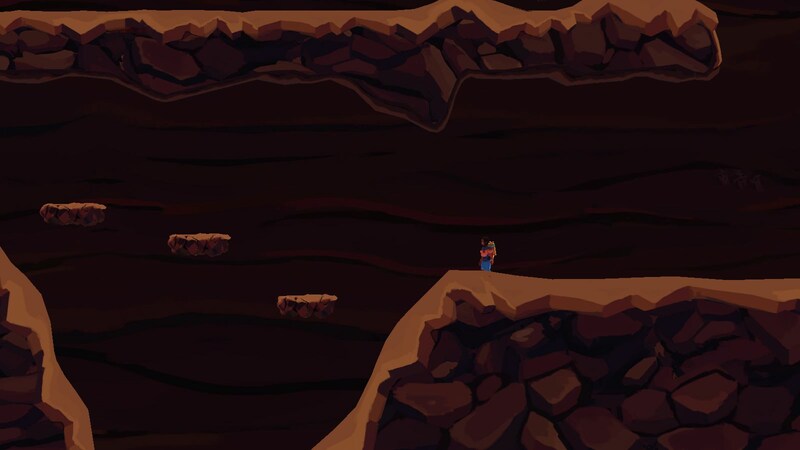 In the first area, the caves you come to after falling in a well include this one jump that I just could not do despite it looking like Ayo could make it. I remember a collectable teasing me, but I kept missing it and sliding down to what is essentially the starting area. 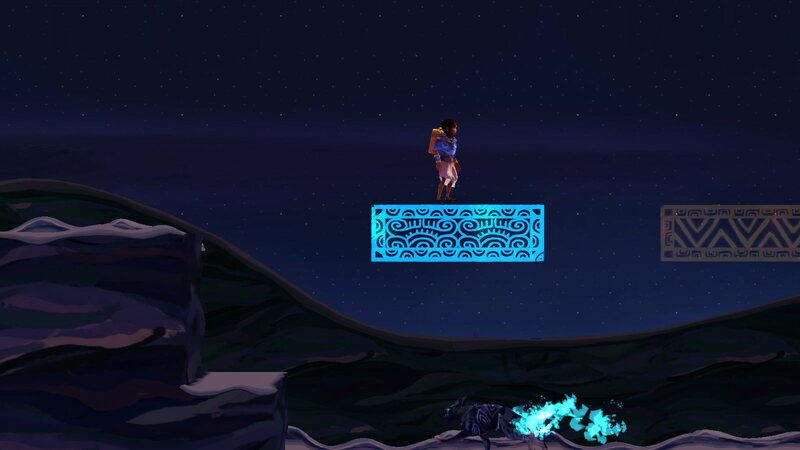 What made it worse was that some jumps that I made before, Ayo would suddenly not want to grab on to, causing my death. If I didn’t return, I would not have played the more enjoyable parts. The game does get better at keeping otherwise frustrating jumps more on the player’s skill than the game bad platforming settings. If you can get past the beginning, you will definitely want to be in it for the long haul. One of the most puzzling things about this game is the music, or the lack thereof. Music is present in the menu, but it stops once you get control and only returns for certain parts of the game. Relying on ambiance is good, though hearing the same sound effects can be a little grating at times. When the music is present though, it does have charm. With the art, it looks nice. Being colorful, but at the same time believable that you are in whatever setting you are in, adding little touches such as Ayo’s clothes corresponding the color that is activated. The only thing that does not stand up to it is the background art, which can be a little dull. While it seems to be a trend near the beginning of the game, it does get better towards the end. 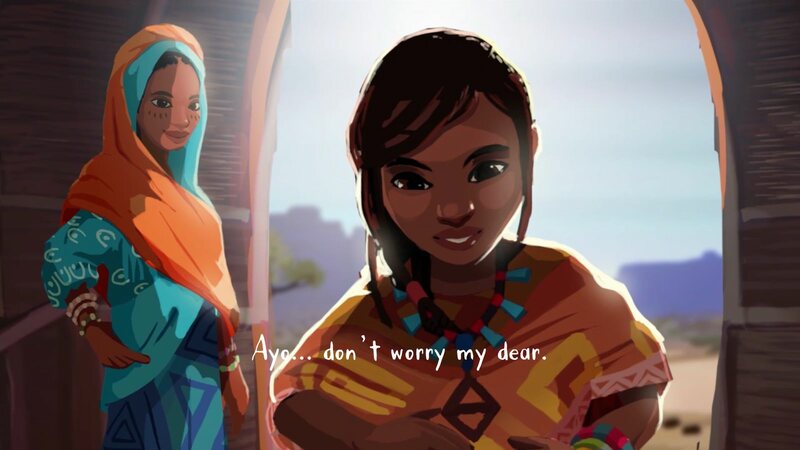 Ayo: A Rain Tale certainly tries hard to bring to light the extreme difficulty of the life of women and girls in Sub-Saharan Africa that are sent to fetch water, having to carry a 40 pound container on their backs due to no access to clean water. Even if you didn’t read what this is based on, you still have to wonder why this child is going out to fetch water with a high chance of dying in the process. It seems crazy especially when there are probably stronger people in the village that could go with her or go instead. There is some real drama and tension that gets emotional towards the end. This might not hit your heart as much as other games do, as it does focus more on the gameplay aspect, but it is commendable. Other than that, it is a decent game with a few negatives that might make this game more frustrating. Just don’t expect a difficult game or a story-centric one.